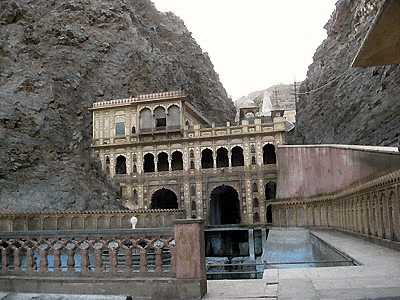 While the Ramanandis didn't reach Galta until the late 1500's, their line had begun hundreds of years earlier. This rasik sect of Rama devotees was originally founded by Ramanandiji (1299-1410 A.D.) who, according to historians, was the first preceptor of Ramabhakti in Northern India. His disciple Anant das, along with his own disciple Krishnadas Payhari, established the Ramanandi matha at Galta. One of the sub-branches to grow out of the Ramanandi movement was the Balanandis, who dominated nearby Jaipur. Both these Vaisnava cults predated Akbar's presence in Galta, and both demonstrated a militaristic mood long before Akbar's arrival. While Akbar's direct intervention with the armed sadhus at Thaneswar marks a clear beginning of his influence in regards to the militarization of ascetics, how the Mughal influence in that realm carried forward from the 16th century to impact the Vaisnavas is not as well known. There are numerous references found in historical documents from the 16th through 19th century describing clashes between the armed sadhus at khumba melas, and other festivals. After Thaneswar, it was mainly the bairagis and gosains who were fighting, and usually the Shaivites were on the winning side. Among the most well known and decisive battles were those at the Hardwar khumba melas in 1640 and 1760, and the Nasik kumbha in 1789. According to Vaishnava historical records, written and oral, it was the incessant attacks by Shaiva gosains on bairagis in the 17th century, and finally the Dasnami capture of Ayodhya in 1699 that inspired the Vaisnavas to arm themselves. Ayodhya had been the target of an earlier violent Mughal attack, when Emperor Babur destroyed Lord Rama's temple at Ayodhya, erecting a Muslim masjid in its place. The 1699 attack on the Vaisnavas occurred during Aurangzeb's reign, about 11 years after he had destroyed an estimated 1,000 temples in Mathura. But as described in earlier segments of this series, the Dasnamis who attacked Ayodhya in 1699 were members of the ten-named classes of Shankarite sannyasis, and they were known to have been militarized well before Akbar's arrival on the scene. This reaffirms the notion that Akbar's influence on the Vaisnavas in this particular sphere, as demonstrated at Thaneswar, was somewhat limited insofar as the armed groups of sadhus roaming North India at this time had taken up serious arms well before Akbar's arrival. Similarly, although Akbar established his Mughal court at Galta, where the Ramanandis were the primary spiritual sect in residence, it does not appear that he exploited the Ramanandis in any significant way. Both the Ramanandis and the Balanandis had already taken on a militarized mood well before Akbar's arrival in Galta, and we do not find – at least in this limited survey – any evidence that Akbar had influenced these groups at another time or place, in any way that carried forward to the time of Sri Baladeva Vidyabhusana's philosophical exchanges with the Ramanandis at Galta. In his book, Peasants and Monks in British India, William Pinch provides an interesting description of how the issue of armed Vaisnavas played out through the 1700's. In essence, what he describes is a set of dynamics related to the degeneration of varnasrama-dharma, which served as a catalyst for the militarization of sadhus far more than any warlike influence brought on by the Mughals. "Records housed in the Kapad Dwara (warehouse of valuables) of the Jaipur state provide independent corroboration of Vaishnava arms and of attempts to limit the entry of the low-born into the Ramanandi sampraday in the Jaipur region after 1700. In the 1720s and until his death in 1743, Maharaja Jai Singh II evinced a strong interest in religious affairs, particularly religious affairs having to do with the Vaishnava institutions in his realm. And, not unlike Warren Hastings a half century later, Jai Singh II apparently looked askance at the phenomenon of armed monasticism and sought to discourage it. To this end, he solicited and received four separate bond agreements containing pledges from prominent Vaishnava mahants, nine of whom identify themselves clearly as "Ramanandi," to give up the practice of keeping arms and to boycott or otherwise punish those who continued to do so. From separate correspondences it is evident that the Maharaja also solicited opinions from Bengali Vaishnavas regarding the rights of shudras and other low classes, and obtained pledges from Ramanandi mahants and other Vaishnavas not only to maintain strict caste rules in commensal relations but to no longer accept shudra and antyaj(low-born) disciples. The fact that Jai Singh II's efforts to impose orthodox behavior on Vaishnava monks involved the demilitarization of the armed akharas in tandem with the barring of low-born novitiates suggests that arms and low status were connected not just in the Maharaja's vision of a neo-orthodox Vaishnavism but in the social-historical reality of Ramanandi monasticism. A third possibility that must be considered and that, by implication, obscures any functional relationship between militarization and social change is that the history of monastic soldiering has been used in the more recent past by conservative, high-caste elements in the orders to explain (by way of apologizing for) the contemporary presence therein of shudras, untouchables, and women. An important related question concerns the organizational status of the military akharas in the nonmilitary sections of the religious orders with which they were associated. The tenuous relationships that today exist between "orthodox" (and generally high-caste) Vaishnava and Shaiva monks, on the one hand, and their respective military akharas, on the other, suggest that sectarian traditions regarding the sudden mobilization of the latter in defense of the former may well have masked more prolonged—if contentious—processes of social openness within the orders as a whole. Indeed, the fact that the military akharas survived the monopolization of arms by the East India Company in the late eighteenth and early nineteenth centuries and continue to thrive as important sections of both Shaiva and Vaishnava monasticism in the late twentieth century suggests that their significance to the religious life of north India was (and is) more social than military. Whatever the answers to these questions, more research is necessary to know the exact fate of the monastic armies after the passing of the eighteenth century. Certainly, despite the loss of an explicit military function, the trappings of military culture implicit to armed monasticism remained for the most part intact under British rule. The soldier sadhu would become domesticated as a conventional monastic type (as naga) and would complement other forms of monasticism organized around scholarship, devotion and worship, itinerancy, or some combination thereof. Given the apparent survival of the culture (if not the function) of military monasticism, it seems likely that members of the wealthy akharas were able to fall back on the substantial endowments, mostly in the form of land, acquired during the turbulent eighteenth century when their military and financial services were in demand. It is also possible that the many thousands of soldier monks supported by the frequent warfare of the eighteenth century simply melted back into the peasant countryside after the supremacy of British-Indian arms had been established in the early nineteenth century. Such an eventuality would be difficult to document; nevertheless, this was the argument of W. G. Orr—whose main evidence was the nineteenth-century proverb that "the man who smears his body with ashes [i.e., the naga sadhu] can wash it clean again, but the man who has his ears pierced (that is, becomes a Yogi) is a Yogi all his days."